Policy on Sexual Violence – Did you know that it is as much for the UdeM community as for visitors or participants to our activities? On the international scene, the CRM has many types of collaborations: scientific, financial and networking collaborations. On the scientific level, the CRM has collaborations with INSERM in Paris, the Institute of Electrical and Electronics Engineers (IEEE), and the CNRS since the CRM became in September 2011, Unité Mixte Internationale (UMI), the sixth of its kind in mathematics throughout the world. The CRM also has scientific collaborations with the three following institutes with the famous Ecole d'été ''Séminaire de Mathématiques Supérieures'', the oldest school in America created in 1962: Fields, PIMS and MSRI. Current negociations are being held to associate IAS with the same event. The CRM has signed a scientific collaboration agreement with two great poles of the Tata Institute: together with Tata in Bengalore in 2008 and Tata in Mumbay in 2010. The CRM is also the only institute in the world that finances and organizes a workshop in applied mathematics and mathematical physics in Havana, Cuba. Collaborations between the CRM and north-american universities as well as other mathematical institutes in the world are too many to be enumerate here. As for the financial collaborations outside Canada, the CRM participates with NSF (USA) to the funding of all scientific activities held by the CRM and likely to interest American researchers.The CRM also has funding agreements with INSERM via its medical imaging laboratory, and of course with CNRS and the CRM partner universities for the UMI-CRM funding. As far as the networking collaborations, the CRM is part of the Association des instituts de mathématiques internationaux and just launched a major inititative uniting worldwide mathematical institutes to sustain education and research in Africa. 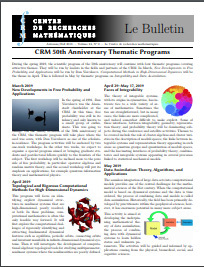 In its publishing activities, the CRM is continuing its partnership with the American Mathematical Society (AMS), in particular with its two series of joint publications, the CRM Monograph Series and the CRM Proceedings and Lecture Notes. It also has joint series with Springer in statistics and mathematical physics. Furthermore, the CRM has exchange agreements with the Fields Institute, PIMS, MSRI (Mathematical Sciences Research Institute), the Institute for Mathematics and its Applications, the Statistical and Mathematical Sciences Institute (SAMSI), École Normale Supérieure (France), the Isaac Newton Institute, the Institut des Hautes Études Scientifiques (IHÉS, France), the Banff International Research Station, the TATA Institute, the Annual Meeting in La Havana, two Groupes de recherche internationaux CRNS - CRM and many others.